This article was originally published in Bulgarian in the Journal of Sport Science (списание "Спорт и Наука"). In addition, it was translated into English, and it is now available on this page. Artistic gymnastics is one of the few sports that pre-school children can practise. It develops basic physical skills and body symmetry. However, for the achievement of these characteristics, an individual approach to the training process appears to be a crucial factor, especially for children. The adequate assessment of physical development is essential for individualising sports training. Thus, the aim of our study was to assess, using accessible methods, the physical development in pre-school and primary school children practising artistic gymnastics. The survey included 40 children (22 boys and 18 girls) between the ages of 4 and 12, engaged in gymnastics. Certain anthropometric (height, weight, body mass index (BMI)) and dynamometric (grip strength of the left and right hands) indicators were measured. The age dependent percentile- and Z- scores for each anthropometric indicator were calculated using specialized software of the World Health Organization (WHO). According to BMI Z-scores, seven of the children, who were included in the study, were assessed as overweight. However, this group included gymnasts, with over two years of experience in sports and a low body fat percentage, who could not be defined as overweight children; greater sports experience led to equalization of grip strength in both hands and an increase in the arm muscle area. BMI does not provide an adequate assessment of the weight and physical development in child athletes with greater muscle mass. In these cases, additional indicators (% fat, muscle hypertrophy and dynamometry) for proper assessment of a child’s growth and development for the purpose of training practice should be included. The data analysis of anthropometric measurements and medical examinations over recent years have shown a positive change in terms of the height of children from 7 to 18 years of age. However, physical fitness decreases because PE and sports in schools does not provide enough of the physical activities which are crucial during the growth and development of young children (Petrova et al., 2009). Therefore, children and adolescents need extra physical activities, where they are engaged in appropriate sports. Artistic gymnastics is one of the few sports which children from pre-school and primary school can practise. It develops those main qualities which define physical fitness: strength, speed, endurance and flexibility. The floor exercises and the apparatuses provide a huge diversity in terms of movements, which lead to positive outcomes for the pupil’s physical development (Pajek et al., 2010). Many studies highlight the benefits of this sport. Gymnastics classes integrated with physical education courses (independent from growth) promote positive changes in motor performance variables in seven-year–old girls. Precisely, ten weeks (twice-a-week) of gymnastics training improved flexibility, explosive/static strength, muscular endurance, speed and balance parameters in kids (Alpakaya, 2013). It is well-known that the amount, intensity and duration of training do not have the same effect on all of the participants. Therefore, individualisation of the training is needed in order to achieve proper and harmonious development. What is of essential importance regarding individualisation in sports training is the provision of an adequate assessment of the individual’s physical development with the employment of all accessible methods. In order to track growth and development, as well as to reflect the overall status of children's health, the main criteria which are used are anthropometric data (height, body weight, skinfolds, etc.) (NHNES, 2007). Body mass index (BMI) is used to assess body weight by dividing weight in kilograms (kg) by height in metres (m), and the result is divided by height (m) again (Petrova et al., 2008). The WHO recommends that percentile and Z-scores should be used in order to assess height, weight and BMI results for children (5-18 years of age) (Kuczmarski, 2000). Measurement of skinfolds and body circumferences allows us to determine the percentage of body fat (%BF) (NHNES, 2007). Few equations in the literature are based on only 2 skinfold thicknesses (triceps and subscapular) and these were developed specifically for children and adolescents. One such set of equations, the quadratic equations of Slaughter et al (Boye et al., 2002), is frequently used in the United States and European countries (Slaughter et al., 1988). Another significant indicator is upper arm muscle area, which appears to be a useful index of muscle mass in healthy children. Upper arm circumference and triceps skinfold are needed for its calculation (Boye et al., 2002). The aim of this study was to assess, using accessible methods which will enjoy a wide application in practice, the physical development of pre-school and primary school children practising artistic gymnastics. The study included 40 children (22 boys and 18 girls) between the ages of 4 and 12 years, attending gymnastics classes at the ‘Sports Centre Levski’ in the capital of Bulgaria, Sofia. They were divided into two groups: pre-school and primary school. Moreover, another two subgroups were separated depending on the children’s sports experience: 13 boys (7-11 years old), who had less than two years (1-24 months) sports experience and had never taken part in gymnastics competitions, and 6 boys (7-11 years old), competitors with sports experience greater than two years (24-48 months), who had participated in national championships and tournaments. The standing height of the children was measured to the nearest 0.1 cm with a stadiometer, and their weight using an electronic scale to the nearest 50g. We used specialised software prepared by the World Health Organisation (WHO) – ‘WHO Anthro’ (for children under six years of age) and ‘WHO Anthro Plus’ (for children over six years of age), to assess height, weight and BMI in children (World Health Organization, 2007). For each variable we calculated the Z-score and percentile score for the relevant age. To distinguish the BMI scores, we used references provided by the WHO for children from 5 to 19 years of age (overweight > +1 SD, obese > +2 SD, underweight < -2 SD, mortality <-3 SD) (World Health Organization, 2007). Body fat percentage (% fat) was determined by the sum (Sum) of the two skinfolds – triceps and scapula (Slaughter et al., 1988), using the equations of Slaughter, as they have been specifically recommended for male and female adolescents because of their accuracy and simplicity (Boye et al., 2002). The upper arm muscle area – (UAMA) was calculated using the formulae (Boye et al., 2002). Triceps and subscapular skinfolds were measured on the right side of the body to the nearest 1 mm, with a Lange skinfold caliper. The maximal isometric grip force of both hands was determined by a threefold muscle effort using a dynamometer for children, which is accurate to within 0.5 kg. All measurements were taken by following standard procedure (NHNES, 2007; Piwoz et al., 1985). In order to analyse the results we used the following methods: Analysis of variance (ANOVA) and Student’s t-test for statistical significance. The anthropometric data of the pre-school and primary school children, who were the subject of our study, are presented in Table 1. The calculated average BMI scores were in accordance with the literature data. In a study concerning elite gymnasts between 7-10 years of age and 11-14 years of age, the range of BMI was between 12.9-20.8 kg/m2 and 14.6-20 kg/m2 for the two groups respectively. The percentage of body fat for the same age groups was 5.1%-16.7% and 6%-15.1% respectively (Benardot et al., 1991). Table 1. Anthropometric data of the pre-school (3-6 years) and primary school (7-11 years) children, who were the subject of our study (Average ± SD). The average percentile and Z-scores of height in the children from our study showed slightly lower values. This data is normal for young gymnasts in comparison to other children (Jemni, 2011). All of the other scores from our study were in accordance with the norm. However, the results achieved by some authors point to a lower percentage of body fat and BMI score for children (especially girls) practising gymnastics, in comparison to school children (Jemni, 2011). 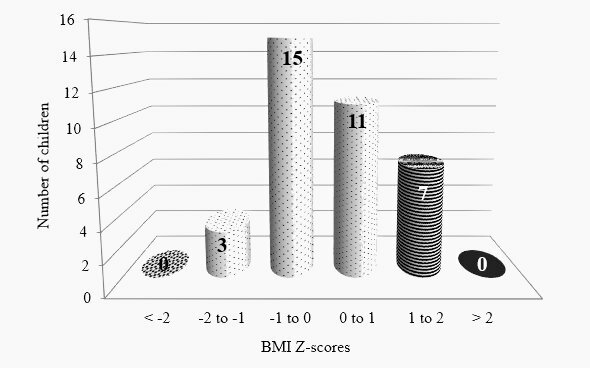 BMI Z-scores of the children under study are presented in Figure 1. Obesity (score > 2) or mortality (score < -2) was not registered. Figure 1. BMI Z-scores for the children under study. The BMI Z-scores of 7 children were in the range of 1 to 2, which defines them as overweight. The anthropometric data of these children is presented in Table 2 according to their body fat percentage. The data of the first two (N1 and N16) and the last two (N30 and N19) children stood out. The last two have little sport experience (5 months) and greater percentage of body fat (22.3% and 30.4%), which identifies them as overweight. Adjustments for these kids should be made in two directions. Firstly, the volume of the aerobic exercise in the preparatory part of the gymnastics session should be increased. Secondly, foods with high energy content (bakery products, chocolate, candy, etc.) should be minimized, and those of fruits and vegetables maximized. This change in diet can be achieved through conversation with the children’s parents, emphasizing the fact that normal weight helps to maintain good health and reduce the risk of many chronic diseases. Coaches and teachers can use their authority to encourage children to adopt a healthier diet. Table 2. Anthropometric data of the overweight children (BMI Z-score between 1 and 2). The first two children have great sports experience (about 2 years). Although their BMI Z-score exceeds 1, these children have a low % body fat (11.7% and 13.7%), which does not identify them as overweight. This example shows that BMI is not always a suitable indicator for assessing weight. Moreover, other authors express the same view in their studies concerning athletes with great sports experience in sports which require physical strength (Zaikova et al., 2011). Therefore, more anthropometric data (% fat, skinfolds) should be taken, as well as strength indicators (data for muscle hypertrophy and dynamometers) in order to accurately assess the weight of young athletes. Anthropometric as well as dynamometric data (grip force) is presented in Table 3 according to age groups. Table 3. Anthropometric and dynamometric data of the children under study (Average ± SD). The results showed no statistically significant differences in the values of grip strength indicators between the right and left hands. All respondents were right-hand dominant, but there was no more than a 10 N difference in the strength of their hands. We could not find data in the literature for pre-school children to compare their strength indicators. However, the results of primary school children (7-11 years old) were compared to the Dortmund Nutritional and Anthropometric Longitudinally Designed study, ‘DONALD’, concerning children between the ages of 6 to 18, in Germany (Boye et al., 2002). Their anthropometric data is measured on the right side of the body, as it is in our own study. Grip force and upper arm muscle area show higher average values in the German group (boys with an average age of 8.7 years, n = 59) in comparison to boys from our study (131.4 N against 111.9 N and 22.6 cm² against 21.8 cm², respectively). However, there is no statistical significance which can be placed upon these results. Average values of skinfold triceps and subscapular are 10 mm and 6.3 mm in German and 7.7 mm and 5.1 mm in Bulgarian boys. It should be observed, however, that the boys from Dortmund have a higher average age (by 1.2 years). Age as well as skinfold thickness have approximately the same average values in German (n=50) and Bulgarian primary school girls (8.7 years against 8.4 years). However, the value of skinfold triceps is slightly higher in the German group (11.9 mm), in comparison to the Bulgarian girls (11.2 mm), and there is not enough data to check the statistical significance of the difference. The primary school girls from our study have a higher average value of their upper arm muscle area (25.5 сm² against 20.7 сm², p < 0.01). Probably, this difference is due to the fact that the Bulgarian girls practise gymnastics. The girls from Dortmund show a slightly higher average value of right hand grip force in comparison to our group (108 N against 100 N), but once again there is no statistical significance in these figures. Figure 2 presents a comparison of the anthropometric and dynamometric data in primary school boys with less than two years’ sports experience in gymnastics (7.3 months average), and boys with sports experience greater than two years in gymnastics (36.8 months average), and who participate in national competitions. Although the competitors have a lower average age, the upper arm muscle area (UAMA) shows, statistically speaking, significantly (p < 0.05) higher values in those children with sports experience in comparison to those with less sports experience - 23.7 cm² against 20.5 cm² respectively. 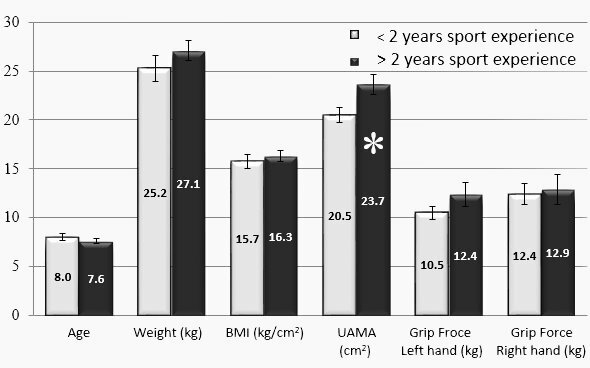 We have also noticed slightly higher values of grip force in both hands, weight and BMI in favour of the group of competitors. We assume that this is because of the greater muscle mass which is accumulated by the boys with greater sports experience, as a result of the gymnastics process. The equalization of their force grip in both hands is also well illustrated. That is once again a direct result of practising gymnastics, a sport which develops the body symmetrically. The amount of aerobic exercise in training sessions should be increased for overweight children, and adjustments in their diet should be made. This article is also available in Bulgarian. Reviewer: Prof. Maria Toteva, D.Sc.